A Japanese Dream. An International Success Story. The story of Benihana had its roots in Japan when Yunosuke Aoki, a samurai descendant and a popular Japanese entertainer together with his wife Katsu, opened a small coffee shop in Tokyo. A red safflower found in the neighbourhood streets gave the Aoki’s the inspiration for the restaurant’s name; ‘Benihana – or ‘red flower’ in Japanese. Would recommend arriving early as getting drinks at the bar may take a while,,and not allways what you ordered,late in seating,but manger sorted some free starters for the table which was great,,dinner in all was fantastic and would go back if only to be served dinner by Francis who made the night for me and the family,In all,frustrated at beginning but Francis saved the day. The decor is lovely and all the staff were welcoming and friendly. We had good banter with our chef and the food was delicious! I have been to other Benihana’s in New York and Los Angeles so it’s nice to have one in Glasgow now!!! Great food, great service, beautiful atmosphere. Came through for my 30th birthday celebrations and will make a repeat visit soon. Fantastic from start to finish. Went for the firat time on saturday for my husbands birthday. Was really great experience, and atmosphere was lovely. Food was delicious and cooked so well , i even tried things i didnt think id like and i loved them! Our chef was called May and she was lovely. The only thing to make people aware of is that the whole meal was around 2 and 1/2hours start to finish but doesnt feel like you are waiting at all as you are so engaged in the cooking. Our dining experience was not what we expected. Having dined in Benihana in Tokyo and Dubai we were expecting a fun filled evening for our daughter's birthday. Instead the waiting staff were slow often having to be told on numerous occasions to bring our drinks. 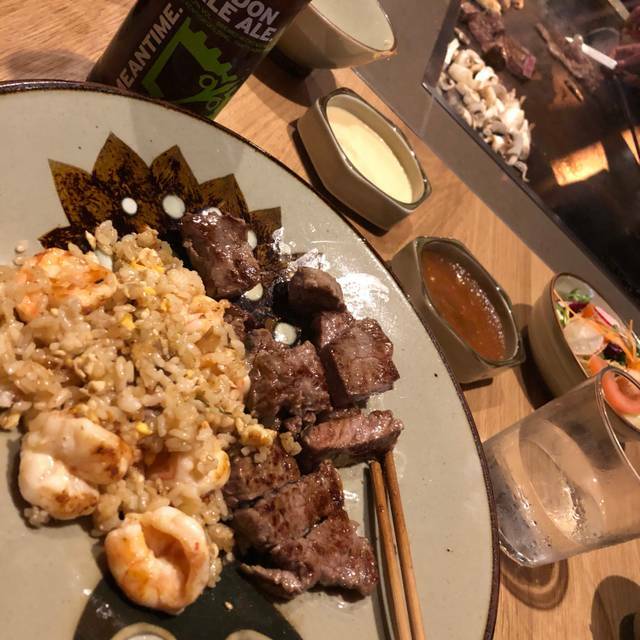 With Benihana the experience is all with the chef and whilst we felt sorry for our chef who was obviously just learning this had a negative impact on our dining experience. She did not have the confidence or the chat the other chef's have, she forgot the teppanyaki sauce on the meat and was just not up to the standard expected of the £398.00 bill. The music was also very loud which made it difficult to participate in conversation. Really a very poor experience all round. We had a booking for 9pm and weren't seated until 10pm. We then waited another 40 minutes for food but eventually left. The atmosphere was great, staff were helpful and the drinks & appetisers we were offered were really tasty, but it was clearly far too busy for the limited number of staff to cope. It would have been better if we'd simply been told how long we would have to wait so we could've decided to go somewhere else, but every time we asked we were told we'd be served "very soon". We ended up leaving at almost 11pm so it was too late to go anywhere else. Other tables looked like they were having a great experience, so I think it was mostly an issue of poor timing/too many bookings taken at once. Again, all the staff were very helpful and it clearly wasn't their fault- if we'd just come in for drinks I think we would've had a great night. Our chef Gary had a really good sense of humour and enhanced the whole experience. It was wonderful experience. Certainly very entertaining. Cocktails were delicious! Food very good too although my beef was rather chewy. Music great, fantastic ambiance overall. I do however think that it is overpriced. Special night out prices but a lovely meal with a great warm welcome from the staff. Completely stuffed - in a good way - afterwards! Great fun with amazing food. Very noisy place so hard to chat with dining companions. We had a really enjoyable visit here for a special birthday. It has a loud and clubby atmosphere. Francis was our fantastic chef who put on a great show and plenty laughs. The food was really good, worth going for a special occasion but probably not a regular place as not cheap. But you’re paying for the experience really so definitely should be tried. Staff were amazing. Francis our chef made our night. He was funny, talented and an amazing chef who just made everyone's night special. Certainly not just a meal but a complete dining experience I will remember! An amazing experience with awesome food. Would highly recommended! As expected. Top quality chef, service and experience. We had a Nice experience. But because we are used to going to the London restaurants we are used to a higher level. The Glasgow branch does not match up to them but is ok. Our chef was from Glasgow so it wasn't as authentic as having an Asian chef. And he wasn't as good as the other chefs we had in London in terms of the food and the ambience. Just loved it, every bit of it. Outstanding food and excellent service. Will definitely be returning soon. My fiancée and I went for dinner on a thu night, it was that busy and we lucked in getting a chef all to ourselves! Katie was great craic and told us about all the food and more besides. The rest of the staff that night were all very helpful and attentive. Great food and we will definitely be back at some stage. Great place with a great atmosphere. The food taste and presentation were excellent. Would highly recommend. Absolutely amazing experience, the best customer service, and the food was out of this world! Truly amazing! A little bit on the expensive side but and incredible experience! The food and dining experience is incredibly unique. Food is incredible and the service is impeccable. An experience not just a meal. May, our chef was fantastic, as was our waiter (a man with long hair and a stubble) I was disappointed to find I couldn’t tip via the card machine as the service was phenomenal all round and didn’t have cash on me. We will be certain to double tip next time we visit which will be soon if the quality of the meal was amazing. We booked in for our anniversary and were greeted by every member of the staff from front of house to manager with a happy anniversary as well as as some additions to our desert free of charge and 'happy and you know it' sung in Japanese. This topped off an amazing Tepanyaki experience with our food cooked in front of us my wife had the chicken teriyaki and i had the cod and we must recommended the Sake flights but share if you don't want to get too boozy. Good welcome, but waited too long for food. Menue not explained well and how kids meal would work. Kid felt left out. Chef friendly but didn’t interact as well with kids as seen in other restaurant. Server new but done well. Service slow and wine not kept topped up. Seemed expensive. Ross was our chef and he was fantastic. Food was amazing. Service and food outstanding. From when we arrived we were made very welcome and offered a great Gin deal. The staff were very knowledgable about the food and they catered for my intolerance of dairy. The food and ambience were really good. The Tapinyaki show could have been more interactive. Would go again and recommend it for friends. Chef was entertaining and he cooked my steak perfectly. However, the prices are steep for drinks and the food combos. I suspect this is due to the spectacle of the meal but I don't feel it is worth it. Appetisers were the highlight for me. If drinks were cheaper I could definitely see myself coming in for gyozas and cocktails. Fantastic meal, great cocktails, great service. Would highly recommend! So great to have a Behnihana in Scotland. The food here is outstanding and such a fun dining experience. I have had more entertaining Benihana experiences but they are new so I am sure the chefs are still gaining confidence. The menu is very varied with lots of options for meat, seafood and veggie lovers. The food is on the pricey side but is absolutely delicious. It is all cooked right in front of you, just as you like it. You also get a lot for what you order especially if you go for one of the platters. Great food and entertainment by the chefs. Staff was excellent with efficient service. However as the food being prepared by the chefs is very interactive the music was far too loud for the type of atmosphere to engage in.